This week's question is a two-fold cautionary tale: first, it illustrates the importance of annunciation enunciation, and second the importance of the reference interview. What I thought I heard initially was certainly not what this patron actually wanted. One of my wives' books is overdue - can you renew it for her? Of course, what he meant was "One of my wife's books..." - it loses a little in the translation to typing it out, but it was pretty clear over the phone. Clearly wrong, though, and it made me laugh. 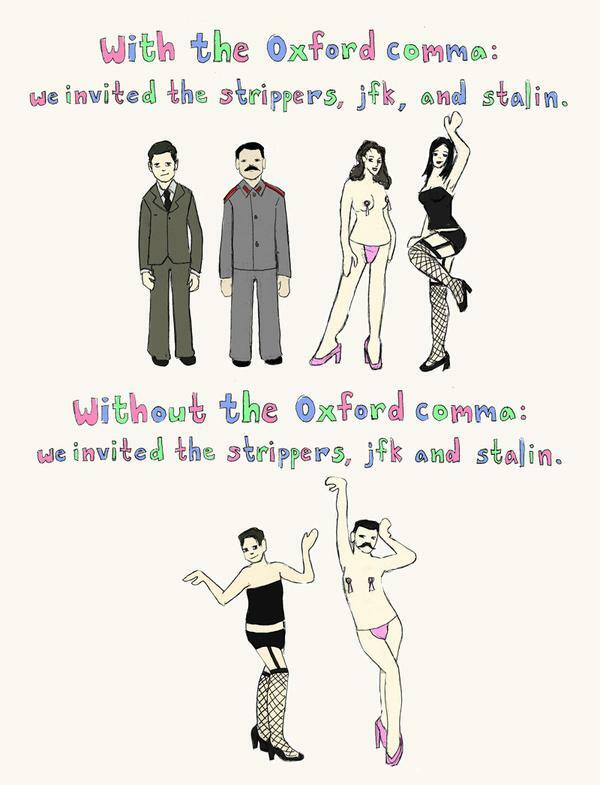 It also reminded me of the joke about the importance of the Oxford comma. But, item renewed, so everyone is happy (in a very non-polygamous sort of way). In this funny video, replace "dad" with "library patron" and it's a reference question many librarians know all too well. At least, for the first third of the video - after that, it gets kind of weird and definitely violates the appropriate library behavior policy. Do you have a book that tells me all the bridge heights between here and Florida? I felt there was more to this story. After a bit more questioning, I learned that he and his wife bought a new RV, and were leaving next week for Florida. 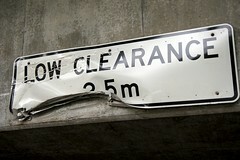 Since buying it, though, he'd started to notice signs everywhere he drives indicating the clearance under bridges. To prepare for their road trip, he wanted a book that will help him plan a route that won't take him under any bridge that is too low for their RV. We did not have any book that gave this information. One possibility, I thought, was to check our various road atlases to see if they might indicate this. None of them did. I thought the best bet would be to contact AAA, but first, I tried an internet search for interstate bridge clearance site:.gov. This led us to a U.S. Dept. of Transportation Federal Highway Administration memo on vertical clearances of the Interstate System. Although not a strict specification, the memo did state that most interstate minimum clearances are 4.9 meters, with some being 4.3 meters. Patron: Meters? We came to America to get away from the metric system. What's that in feet? Convert 4.9 meters to feet yields approximately 16 feet, and 4.3 meters = ~14 feet. This made the patron happy, as his RV is 13 feet high. I still felt I needed to give him more, so I asked if they minded waiting while I called AAA. I often call outside resources who are likely to give an expert answer on something, and luckily in this case I am an AAA member. I looked up the local AAA office in the phone book, and the first person I spoke to said enthusiastically that yes, AAA's TripTik department does have this information, and he transferred me to them. But surprisingly, when I explained what I was looking for to the TripTik operator, she said they did not have this information. She did have some advice, though - avoid Parkways. These roads, such as the Merritt Parkway (CT) and the Garden State Parkway (NJ), are designed for smaller, non-commercial-sized vehicles, and often have lower under-structure clearances - especially toll booths. Huh. I think this bit of information jogged her memory, because she then said that yes, AAA does publish a book with this information. It's called the AAA Truck & RV Road Atlas (Amazon is the only listing I could find), and is available at any AAA office. I relayed this information to the patron, and he was delighted. He was a brand new AAA member, and was happy to have a reason to go use his membership. The AAA woman said the book retails at about $22.95, but is discounted for AAA members at the local offices. My library does not have one, so I might have to add it to the collection.